When strange things happens, choices mades involuntarily - maybe Asguard - Hidden God was responsible for all of this?! Returning To My Horizon Starting with the haunting string chime Daemon Cavalcade combines a fierce powerful rhythmic flow with lofty modern style motives. A leisurely start intriguing with anticipation of the arrival at The Outpost. Then the guitars ant drumms supports vocals narration, keyboards hovering over them like spirit of the main motif. After a brief introduction Hidden God unleashes all the accumulated power in a burst of instrumental fury and vocal hysteria. Then comes the respite for instrumental rabies, keyboard passage in the light beams of modern interpretations raises us to the sun, then the powerful rhythmic guitar riffs followed as cortege for it. Fingers make their way like spiders on the guitar strings .... and here we hear command Conscript! Fall into line! And the detachment of instrumental host breaks in march, sweeping the opponent out from their path. However, the opponent just sergeant's head, that's all. Romantic motifs come to the surface of consciousness, invoking memories of the forgotten depths of the memory, Where Everything Was Different from present state. The composition consists from the various parts - romantic and melodic clean vocals hesitation and fierce instrumental power and growling aggression. Strange and unexpected phenomena and things requires detailed and careful examination. 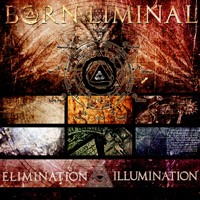 Born Liminal - Elimination/Illumination (EP) have applied thereto! Cosmos emits its breath, bringing it by female vocals flow, then growl yells Stainand! The combination of the unexpected guitar riffs, shifting from invisible dimensions and alternation of different kinds of vocals drives composition to the end. Measured powerful blows hammered reliance for the path of title track Elimination Illumination, over which hovers a ghostly tune, driven keyboards. After the lapse of a certain segment of the detachment accelerates its movement over it hovers keyboard passages and vocals alternated growling and screaming to each other. Strangled female whisper completes the track. Opera female chant combines with a vicious growl during intro of the Incertae Sedis in a sad and dismal symphonic saga. Then growling vocals overwhelms the foreground of sound image, saturating the atmosphere of sad romance with rage and anger, overflowing it with the shades of its mad fury. Quiet procession is shaded with dark atmosphere of trouble expectations. A Human Work as multi-faceted composition that combines thoughtful stories to drive violent screams, inclusions of emotional recitative and womans cries, and bird calls - that is so difficult to describe it! Listen to it to make your own decision! It is - the sheer variety!